Justice Scalia Gives Obscene Gesture? Supreme Court Justice Antonin Scalia used an Italian hand gesture when questioned by a reporter after attending church this past weekend. The Boston Herald reported Monday that the justice made "an obscene gesture under his chin" — which prompted some online reports that Scalia had used his middle finger. The sign he used in Boston is frequently used by Italians to express displeasure with someone — from mild to deep irritation. It is done by cupping the hand under the chin and flicking the fingers like a backward wave. Scalia was leaving Mass on Sunday at the Cathedral of the Holy Cross when the reporter asked the justice if he had to deal with much flak related to his conservative Roman Catholic beliefs, according to the newspaper. "You know what I say to those people?" Scalia said before making the gesture, according to the paper's account. "That's Sicilian." The paper said that Scalia also said: "This is my spiritual life. I shall lead it the way I like." Meanwhile, CBS News reported Monday that Scalia told an overseas audience this month that the U.S. Constitution does not protect foreigners held at the military prison in Guantanamo Bay, Cuba and they do not deserve and American-style trial by jury. The Supreme Court will hear arguments tomorrow from lawyers for a detainee who claims the military trial he faces is illegal under both U.S. and international law. 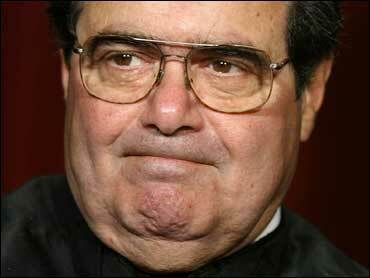 Some legal experts say he Scalia should recuse himself from the case.